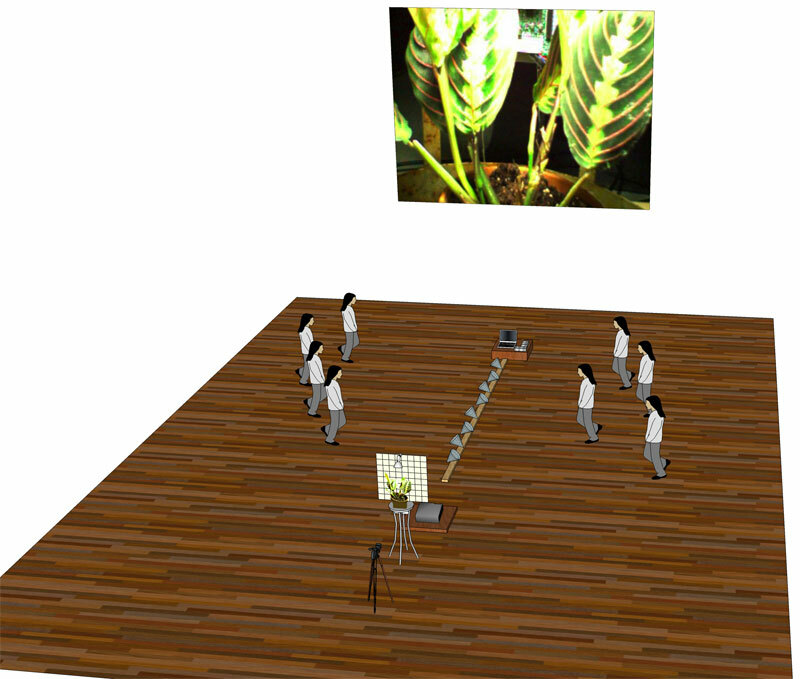 Performers with flashlights control a light-sensitive sound synthesis algorithm as they react to the extremely slow movements of a phototropic plant. 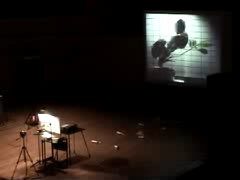 The plant conductor's single 15 minute gesture fills the space with a subtle, slowly changing mass of sound. Each performer's location is determined by the position of one of the plant's leaves on a transparent grid placed in front of the plant. As a leaf moves toward the bottom of the grid the performer moves away from a light sensor, causing a small change in the sound corresponding to that performer. This slow shifting in space and sound subtly mirrors the changing outline of the plant's profile. I was invited to be the featured guest artist at the University of Virginia's 2005 Technosonics VI Festival: "Ecology and E-Music". I decided to create a new piece for the festival, based on an idea I had been thinking through for a few years: a sound piece where the changes in sound are directly controlled by the movement of a plant's leaves. I'm interested in different sorts of time, both perceptual and "real", and I enjoy working with systems and organisms that operate on non-human time-scales. Originally I imagined this as a very long piece (an hour or more) so that the plant would move far enough for a human to perceive the movement visually as well as aurally. However, for the Technosonics Festival I needed to make something that would work in a concert setting within a 15 minute time span. 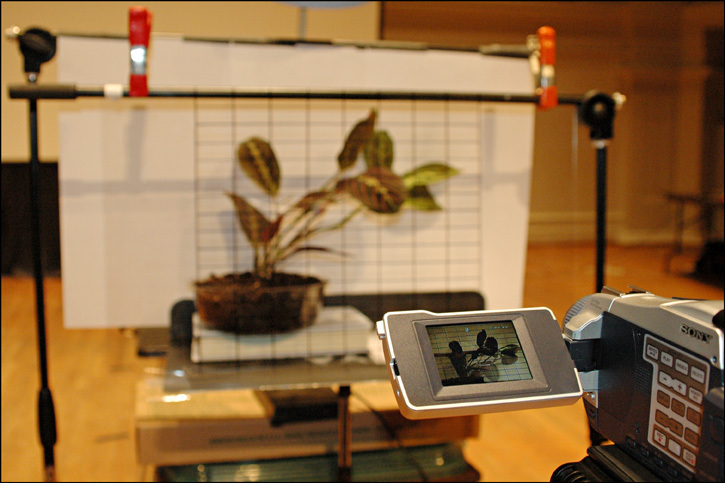 I considered using time-lapse, pre-recorded video, or some other method of warping time so that the plant's movements would be perceivable in 15 minutes. But I wasn't happy with any of the results. Ultimately I decided to make the piece very simple; the plant would move "live on stage", and the flashlight performers would do their best to move along with it. The most interesting thing about this process was that the plant's movements were below the threshold of human perception; although the plant was moving in "real time", the performers couldn't see that. So they tried to hold as still as possible, since that's what the plant was "conducting" them to do. However, human physiology isn't really up to standing perfectly still for 15 minutes. So the performers swayed, wobbled, switched the flashlight from hand to hand, and so on. These small, often unconscious moves ended up being the real "content" of the piece, causing subtle variations in the otherwise static sound. Thanks to all of the nice people at the Virginia Center for Computer Music for their good-natured support and participation. And especially to the performers, for valiantly attempting that which they know they can not do!